Have you ever had a day that is all planned out, and then something crazy happens? Yeah, me neither [dripping sarcasm]. This particular day began in the same way as most, except that my husband left that morning for a two-night business trip. We walked to the subway together, and we took trains heading in opposite directions: he on one train, and the two little ones and I on the other. We walked through the park where the older folks practiced tai chi and the younger ones lined up to buy some aromatic breakfast fare. We turned around and went back to use the squatty potty in the park because one of the kids announced a need to pee and I told said child that they were getting too old to pee in bushes in the city. We counted all the water fountains we passed in the next two blocks and arrived a bit early to what I call “my moms’ group”. I belong to this amazing group of moms who meet together as part of the International Church of Shanghai (ICS). I mentioned the group here. On this morning, the time with those ladies was so good and so sweet. Afterward, we decided to have some lunch delivered so we could avoid taking all of our children and babies out into the rain. I was standing across the room when I heard a piercing scream. I glanced over to see my son kneeling on the floor with his head in his hands, and I immediately thought, “We might be going to the hospital.” He had run across the room and tripped just in time to bash his head on the metal-covered edge of a step. I ran over, phone in hand, to pry his hands away and see a bloody gash on his forehead. Of course, any kind of head wound, even a tiny one, gushes disproportionate amounts of blood. But this one was dripping on his crocs, running through his fingers into his eyes, and splattering on my phone. The cut was too wide to heal without doctor intervention. I pulled him over to where I could grab some paper towels, and by now, all of the moms had realized the gory situation and were offering wet wipes, bandages, and suggestions on hospitals. As I kneeled in front of my son, mopping up blood, I kept thinking of all the distinct issues of having this situation in China. In our home country, we would jump into our privately owned car and drive to the emergency room… five minutes away from our house. We don’t have that luxury here. Although I have my license to drive in China, we don’t even rent a car, much less own one. And sure, his older sister had to get staples in her head in China last spring, but at that time, my husband was home and could take her on his scooter while I stayed with the other two children. As I consciously told myself, “You need to stay calm so that your son can be calm,” I verbally told him, “We will go to the doctor. It’s okay, no problem.” Simultaneously, I filtered through the options. Obviously, we wouldn’t have time to buy a winter coat for him in the afternoon. He might get upset about that. How will we eat lunch? I guess I will figure that out later. What about picking his sister up from school for gymnastics? Maybe I could have her ride home on the bus. And what about right now? Do we go out and get a taxi? It would be difficult to find one in the rain. Do we get an Uber? That’s the best bet, but probably no Uber driver would want blood on the seat of his car. Do we go to the clinic where I usually take the kids? I’m not sure if they have supplies for emergency stitches, but it is near my daughter’s school and we could pick her up right away after our emergency visit. Do we go straight to the larger hospital? Probably, but I don’t know the address or even the Mandarin name of that one. But within five minutes, it was settled. One of the moms offered her van and driver to take us, another mom insisted that I leave my younger daughter with her, and the consensus was the larger hospital, where (thank God!) the driver knew the location and the exact roads to get take. Also by the end of that five minutes, my son had a bandage applied his forehead and a yogurt in hand to calm him down. We had a peaceful, but seemingly forever long, ride to the hospital. When we arrived, I saw two different buildings that had emergency signs on them. I thought they belonged to the same hospital, and the writing was in English for both, so I chose the building with the big red sign and a smaller “pediatrics” sign as well. I walked in and told the triage nurses that he needed stitches. One immediately said, “You can take him to the children’s hospital.” She named two crossroads that I had never heard of, and I thought, “I don’t even know how long it will take to get there.” She finally wrote the address for me in Chinese characters and began to say that I could take a taxi or bus number… I interrupted her and left, so frustrated. I messaged my friend to ask her driver to pick us up and take us to the other place, when she said, “Wait. Did you go to the local hospital?” Oh. Probably. We walked into the second building, and from then on, it was pretty standard. My son got tape and some super glue, was super brave, and only cried when the glue stung his wound. The doctor and nurse kept asking me if he had passed out or vomited and then went on to explain that I should watch for whether he had a concussion. And here’s the free advice interlude for those of you living in a situation similar to mine. Either carry your passport or a copy of your passport and visa at all times. I was asked for my son’s passport at the hospital and was so grateful that I had tucked a copy into my purse. You just never know when you will need it and won’t have time to go home to get it. Also, keep the hospital business card in your wallet with your insurance cards so that you can show it to a taxi driver and don’t have to take time to look up on the address on your phone. We took my friend’s van back to where we had started, picked up my little one who had already been given lunch, got a ride home in the same van, called the school to have my daughter go home on the bus, and postponed gymnastics. I made my grandma’s homemade pudding and ordered burgers and fries for supper. It seemed like the right kind of day for comfort food. When we arrived home, I had time and space to reflect on the previous three hours. And I wept. Sometimes there is so much stress that comes with living in a culture that is not completely familiar, and sometimes there is so much opportunity to receive love that comes with being in a culture that is not completely familiar. I cried from stress and I cried from thankfulness. I’m thankful for three gifts that made my heart whole in the midst of the chaos. Maybe you can relate to these if you know life overseas or if you’ve found yourself an uncontrollable situation. I’m thankful for the ways that my childhood prepared me for living here. We often lived or traveled in places that would require a lengthy drive time to a hospital. I also had the experiences of caring for one of my siblings when her tooth got kicked out by a horse and for another sibling when he cut his finger and fainted. My childhood enabled me to be calm in the moment. I’m thankful for a community of foreigners who love each other so well. When you don’t have the option to be completely self-sufficient, it creates room to accept the strength of others. This group of friends stepped in to help and hand me tissues even when they seemed overwhelmed by the amount of flowing blood. A friend gave me a van and driver even though she didn’t know when I would return with them! Another friend bought lunch for my daughter and took care of her while I was gone, for an indefinite amount of time when she already had her own two kids plus a foster baby with her. A good friend and neighbor sympathized as I cried to her while waiting for the bus to come. A friend from another part of town sent a message asking how I was doing after she heard about what had happened. So many friends sent WeChat messages with prayers and notes of encouragement. I’m thankful to know a God who loves me and my family. That same morning, I read this passage as a blessing for a friend’s 3-week-old baby: “Let the beloved of the Lord rest secure in Him, for He shields him all day long, and the one the Lord loves rests between His shoulders” (Deuteronomy 33:12). I know that I am also the Lord’s beloved (after all, that’s what my name means! ), and I could see glimpses of that love again even in the midst of the stress of that day. The Lord has surrounded me with friends who rally together, who grieve together, who pray together, and who rejoice together, who serve together. Basically, they are what the church is meant to be, and they were Jesus’ hands and feet to me. There were smaller gifts from Him as well. Many moms stayed for lunch instead of leaving right away as usual, and they were present to help me. One friend tossed one yogurt into her bag this morning, thinking that it was an unusual thing to pack, but left it in the bag anyway; that yogurt gave my son enough distraction and nourishment to fill him with peace. My son didn’t show signs of a concussion or any issue other than a wide cut. And plans that I could have had that night had fallen through, giving me time to rest at home with my on-the-mend boy. What are you thankful for? My dear friend, even as you read this, may you have the grace to recognize and accept the gifts that you’ve been given. Happy early Thanksgiving from the other side of the world! Extraordinary. This is my life. At that point, I could have left the room, and she would have been content. But I decided to go deeper. I prayed out loud that God would give Chaya good dreams. Then I said goodnight and let her fall asleep. Chaya had been begging for an animal for over almost a year. I insisted on waiting until she showed enough responsibility to take care of a pet on her own, and my husband told her that we would talk about it after our summer trip to the States. 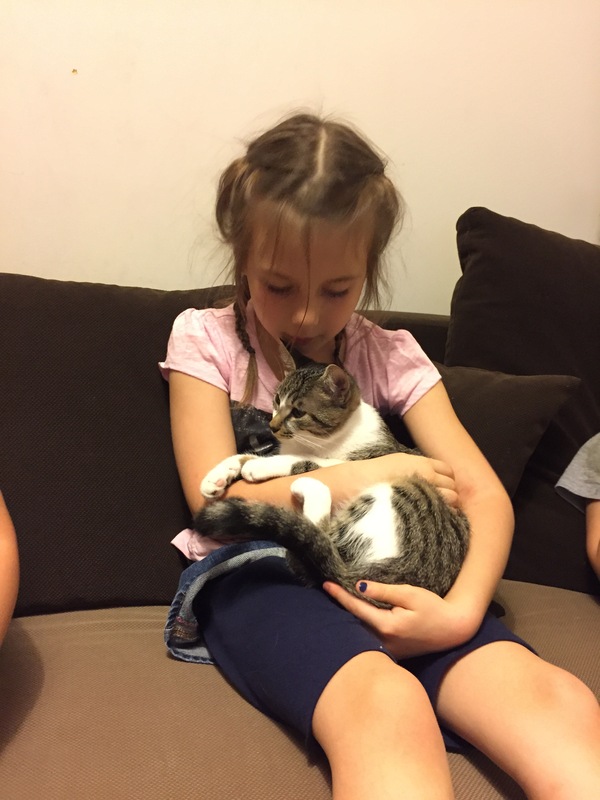 Upon re-entry into China, Chaya reasserted, “When are you going to talk about getting a pet for me?” Josh and I discussed it and decided that a cat would be the easiest introduction into animal care for an elementary student who lives in a major city. We did a quick internet search and found that our city has a couple of organizations which take in stray and injured animals. They give the rescued animals their vaccinations and find foster homes for them. We contacted one of these organizations and filled out a cat adoption application. The lady in charge of the feline adoptions replied and said that we could wait for a couple of weeks, and she would send recommendations to us of the cats that would fit best with our family. We surprised Chaya with the news that we were getting a cat, and then we waited. After another week or so, Josh prodded me to send a follow-up email. So I asked my contact if she had any recommendations for us. I mentioned that my daughter was also very excited and had a dream about caring for a cat with a broken leg. Josh and the kids went to visit the two cats, and shortly after their visit, the lady from the organization wrote again and said that it seemed the consensus that the cat with the broken leg was our ideal kitty. After all, she was the one that didn’t run away when the kids tried to play with her! And so, less than a week later, our 6-month-old kitten with the broken femur arrived at our house. What amazes me, aside from the laughter and playfulness that a kitten can bring to a home, is that God cares enough about a 6-year-old girl to give her a dream of the joy that was to come. A late-summer night’s dream about a cat seems trivial, but we asked God for a good dream, and He answered big. Sometimes we don’t expect a living God to speak. On the other hand, our children are often open to hearing when God talks with them without demanding that He say something. It reminds me of the Lord’s call to Samuel (1 Samuel 3:1-10), in which Samuel responded, “Speak, for your servant is listening.” No wonder Jesus said we must be like little children to enter the kingdom of heaven (Matthew 18:2-3)! A cat may not be able to change the world… but a cat, or a dream about a cat, can change my daughter, who can change the world. Welcome to our home, Lily! Beautiful moments present themselves unexpectedly. If we move on busy, hurried, rushed… we will miss the treasure offered in that time and space. The first time your newborn baby warms your chest. Nurses may have hands on their hips, boring holes into you with their eyes as they wait until they can weigh and bathe that little one. But this moment is worth lingering. The walk through the canopy of cottonwood trees, tiny seeds wrapped in silky fuzz floating through the air by the thousands. You may be on the way to a meeting or running an errand. But this moment is worth lingering. The sacred experience when the Spirit of God fills your soul, so tangibly you can feel it. The sanctuary may empty as others file out or pack up the sound system. But this moment is worth lingering. Today, may you and I have the grace to push back the pressure of hurry and to embrace the gift of lingering. We all face times in our lives when we need to step into the unknown, when a rejection of taking this risk would result in self-protection based in fear. Some of these situations happily force themselves upon us, such as marriage or graduation from high school or from the university and the necessity to set the course for the next stage of our lives. Others slam us hard, like a job loss or an unforeseen change in relationship. And still other opportunities are created from a calling, an unrest, a longing. Whatever the situation, the question all Christians must answer in transition is this: Do I have enough trust – enough confidence – in my God to move forward? One year ago, Josh and I boarded a plane bound for China. 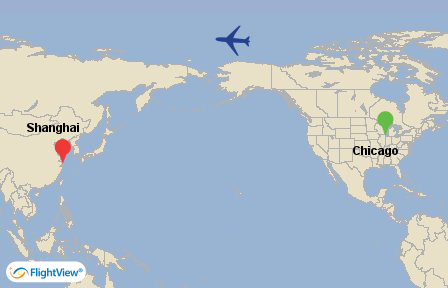 There is something eerie and terrifying about leaving your children on the other side of planet Earth. That May flight, the first of five 24-hour flights that we would make in the course of three months, began our look-see trip, the one in which we visited the prospective city to make sure we wanted to go ahead with applying for the job opportunity. But in those three summer months, and in the five months before that, what impacted me most was not the physical flight, but the spiritual and emotional flight that accompanied the transition. I think that the Lord knows I need recurring themes in my life so that I can finally learn the main point of whatever He is trying to teach me. Those themes don’t usually come in the form of mental pictures, but I am grateful that one did, which I will tell you about now. Twelve years ago this summer, I stepped into my first season of work and career. I sat at a round table with five other new staff, in a room of 200 more just like us. In the midst of a highly intense 10-day training, and at this table, God placed an image in my mind. I was visibly shaking and sobbing as I emotionally processed what this might mean. My group leader asked me what was going on, and I explained the picture to him. In this image, I saw myself standing at the edge of a high cliff. Everything beyond the cliff was enshrouded in darkness. I sensed the Spirit of God beckoning me to jump off of the edge, into the abyss. It was obvious to me that this referenced the new work I was stepping into, since I had little clear idea of what lay before me for the next five plus years. All I knew was that I did not want to fall off of that cliff. I no longer remember my group leader’s exact response (and I’m pretty sure there’s a meme around now with this same idea), but the essence was this: What if, instead of falling, God gives you wings to fly? A few moments over the next eleven years of work felt like I got banged up on the side of the cliff, but even with that, my trust and confidence in God built as I saw Him come through for me over the long haul. He developed in me strength, endurance, vision, and faith that I didn’t have before responding to His invitation into the unknown. 10 ½ years later, I again sat in a room full of staff, this time 2,000 of them. I had grown restless, feeling trapped and looking for a new passion. 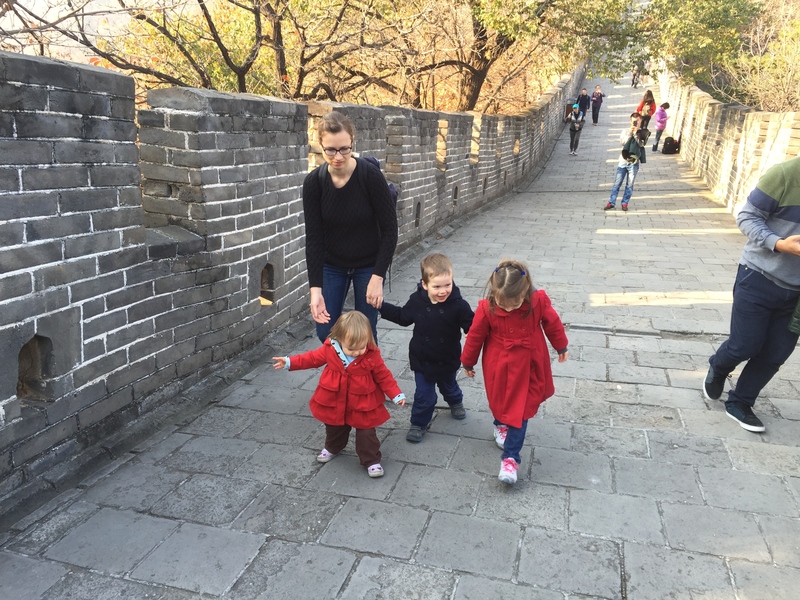 I shared with a colleague that my husband, just that week, began pursuing a potential job in China. I asked my colleague to pray for discernment in the situation, and he wisely asked me how I was feeling and thinking about all of this. He listened intently as I explained my desire for a new adventure and opportunity for myself and for my family. When I had finished, my colleague described to me the image God placed in his mind as I was speaking. He had envisioned wings on my back, spreading out more and more as I spoke. I was ready to fly. Of course, taking flight did not come easily. I grieved the loss, albeit temporary, of people and places that I loved. And once again, I found myself launching off into the darkness, this time unsure of my purpose, my passion, and my calling. I don’t know what risk God is asking you to take. Obviously, assessing God’s call needs to be done with wisdom and with the counsel of wise people. But after discerning clearly, going for it is the best thing you can do for your spiritual life. Maybe your risk of faith looks like serving your spouse, or giving up your summer plans, or giving your life to Christ, or moving overseas. The size of the risk is not important – after all, Jesus tells parables about servants who are faithful in small matters being put in charge of larger matters. When you take a risk, you might not get the outcome that you expect. This is why the Bible says that those who hope in the LORD will renew their strength, as opposed to those who hope in a certain outcome. When you answer God’s invitation to take a step of faith, you are saying, “Yes”, to the God who knows and loves you. Taking a risk of faith, even a small one like tangibly loving someone or speaking truth, is… risky. But it’s exhilarating and freeing. It places us in the position where we HAVE to depend on God to come through for us. Trust deepens when we experience that the God who asks us to jump will teach us to fly. I will leave you with the song that has been my anthem of trust for a year and a half now. To borrow the words of the song, may your faith be made stronger in the presence of the Savior. People in our part of the world have been talking about the lunar new year for a long time. 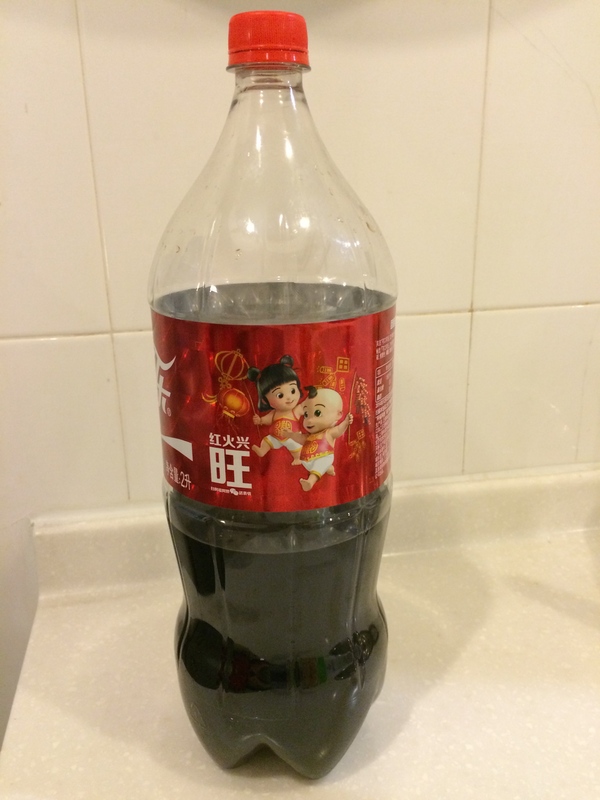 As a first-time expat to China, I had low expectations. After all, this is not “my” holiday. 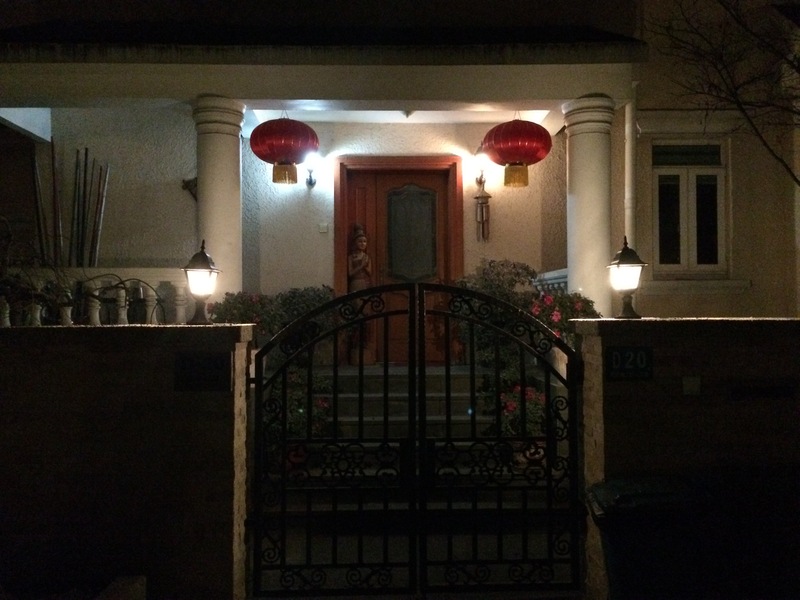 The new year celebration caught me off guard, and here I present to you a small window into my first Chinese New Year experience as a foreigner. Most of us who grow up in the States know the feeling of anticipation that comes along with the Christmas season. A sense of excitement fills the air, everyone chats about the holiday and their plans, and preparation begins for meals, decorations, and gifts. 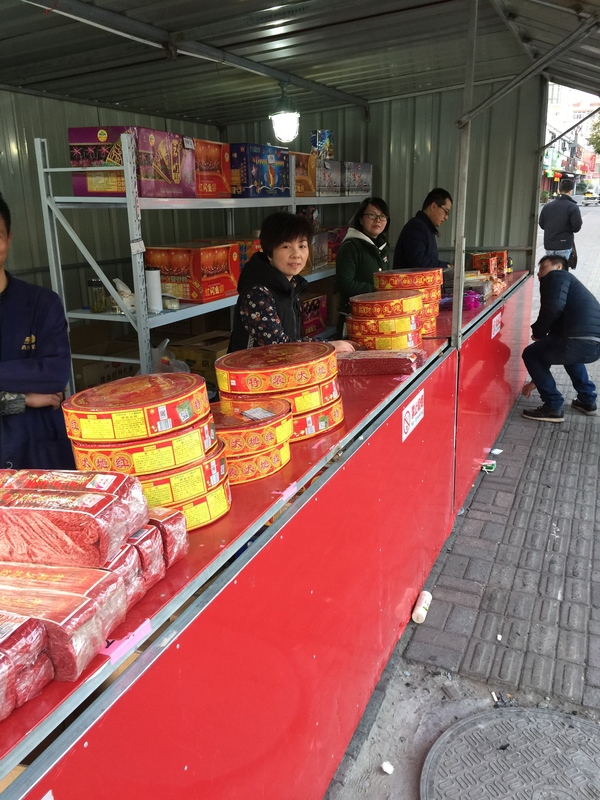 Spending my first lunar new year in China, I was struck by the oddity that I could feel that same anticipation. Even though I speak very little Mandarin and had no background in this holiday, I could just tell that the excitement was building all around me. People cleaned their homes thoroughly. Employees received bonuses. In addition to a bonus, we gave our ayi a fancy box of frozen fish, and she reciprocated with a huge box of butter cookies for the kids. My husband’s company held their annual Chinese New Year party. All of the employee’s families were invited, and the planning team worked for weeks to arrange a location, a catered meal, prizes, and entertainment. My daughter’s school invited all of the parents to watch a Chinese New Year performance. 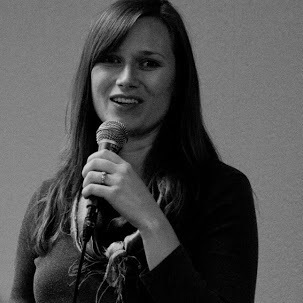 I was so proud when my girl spoke into the microphone in Mandarin – with good tones! The children did a dragon dance and lots of songs to celebrate the year of the goat. Of course, decorations also added to the excitement. My daughter even came home with some window flowers and paper lanterns that she had made in school, and we used those to prepare our home. 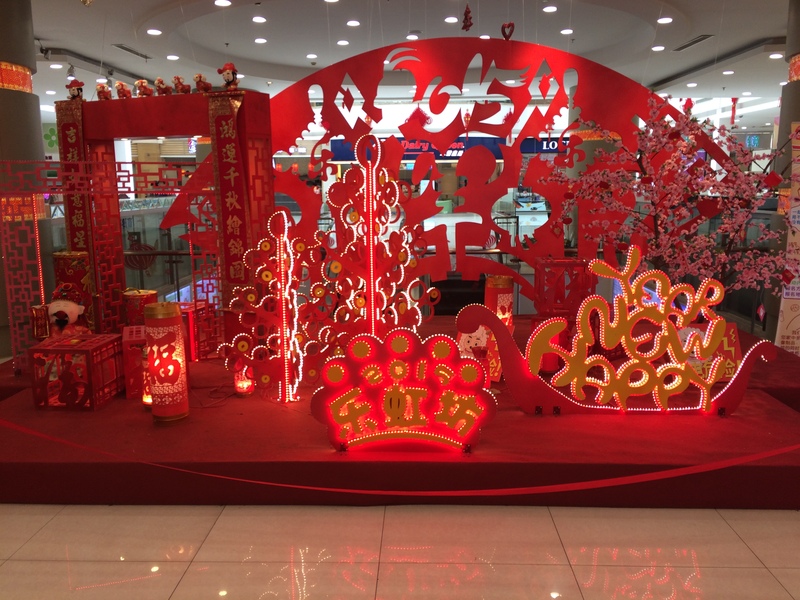 Local malls set up lunar new year displays. People decorated trees and shrubs near their houses. 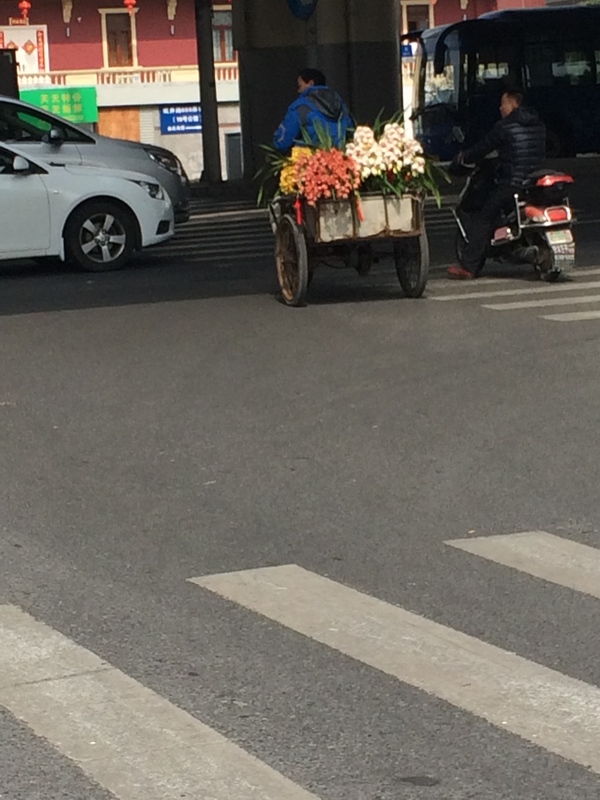 This guy delivered flowers that already had new year baubles attached. 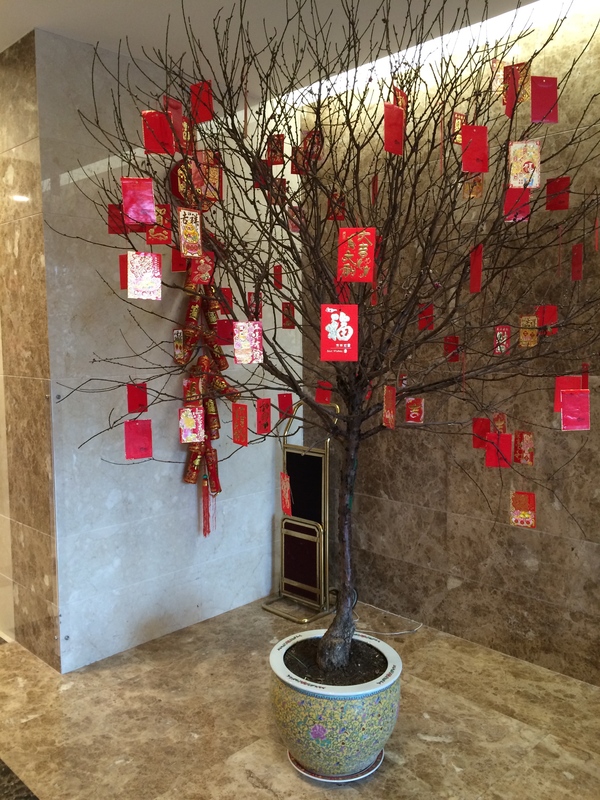 Hotel lobbies welcomed the lunar new year. 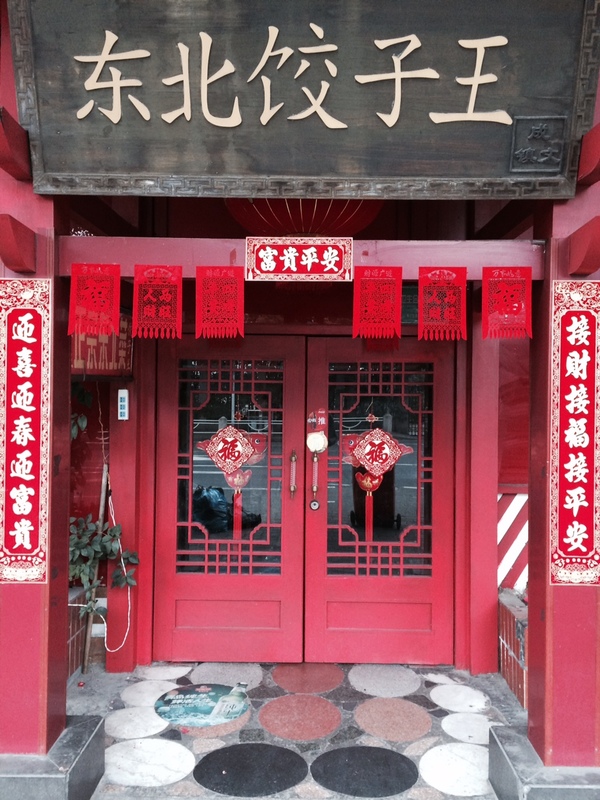 Folks hung red lanterns near their doorways and place greeting signs and paper cut-out flowers on windows and entryways. Apartment lobbies joined in the festivity. 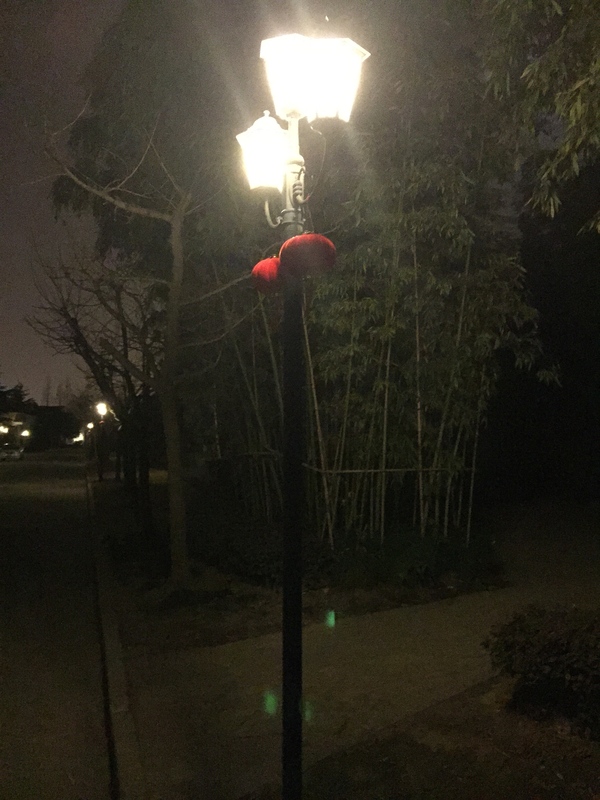 Red lantern decorations hung from street lamps. Owners decked out their businesses to celebrate the new year. And, of course, it wouldn’t be a holiday without decorated Coca-Cola bottles. 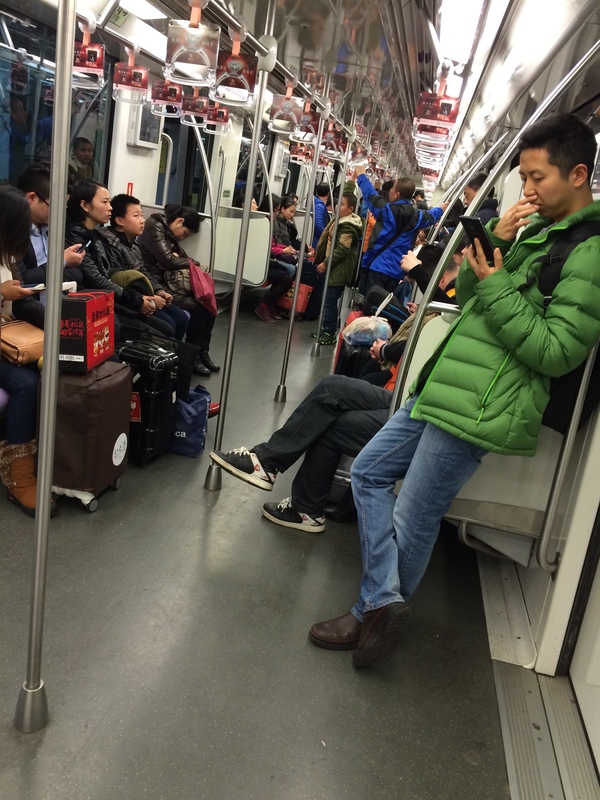 For 1-2 weeks before the lunar new year began, people started traveling in droves. Most people left the city to go back to their hometowns and spend the holiday with their extended families. Subways going to railway stations and airports were packed with people carrying luggage and boxes of alcohol, fruits, or nuts to take home with them. Schools let children out for almost one month at this time of the year. 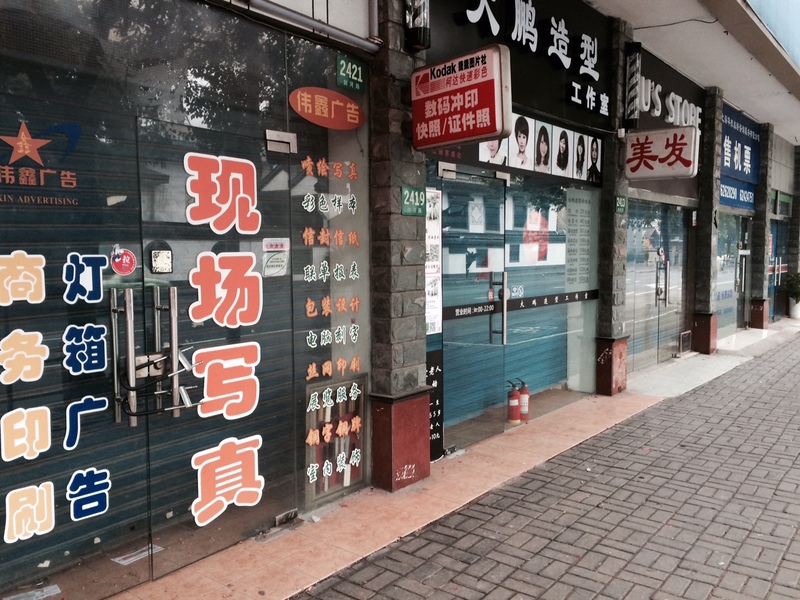 Small family shops closed down early, even a week in advance of New Year’s day, to factor in travel time. In my husband’s family, the Christmas eve dinner is an event all to itself. The meal spread takes time to cook, but it looks and tastes amazing. 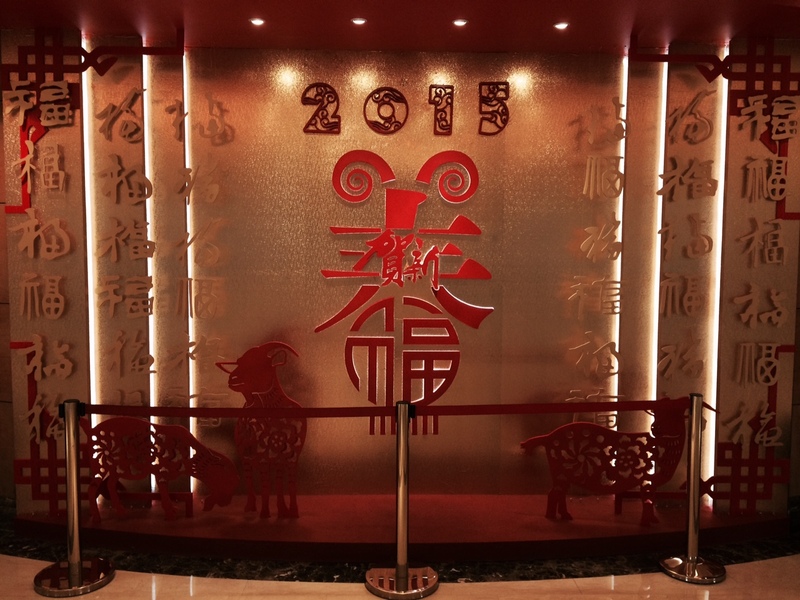 Similarly, in China, the New Year’s eve meal maintains a special place in the holiday tradition. 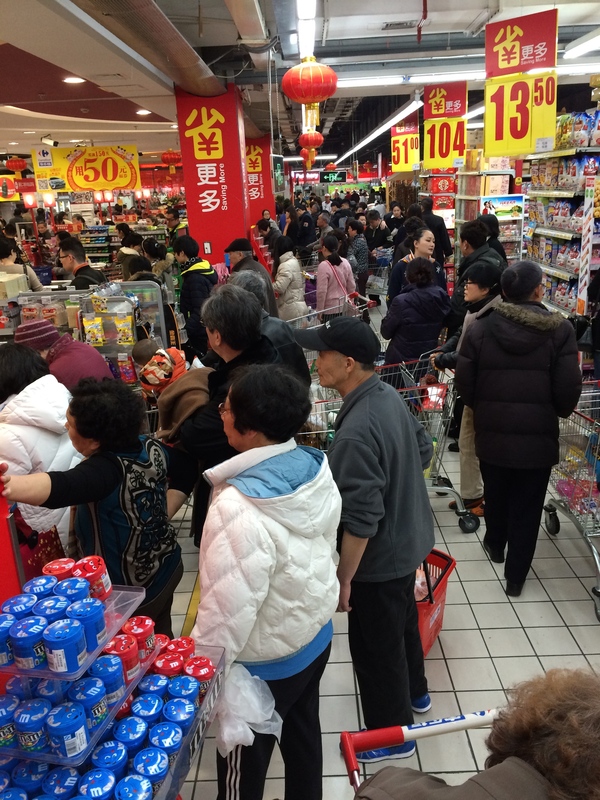 People packed out a supermarket to buy food two days before the lunar new year. Of course, the Chinese have traditional dishes that they cook and eat for the big meal. 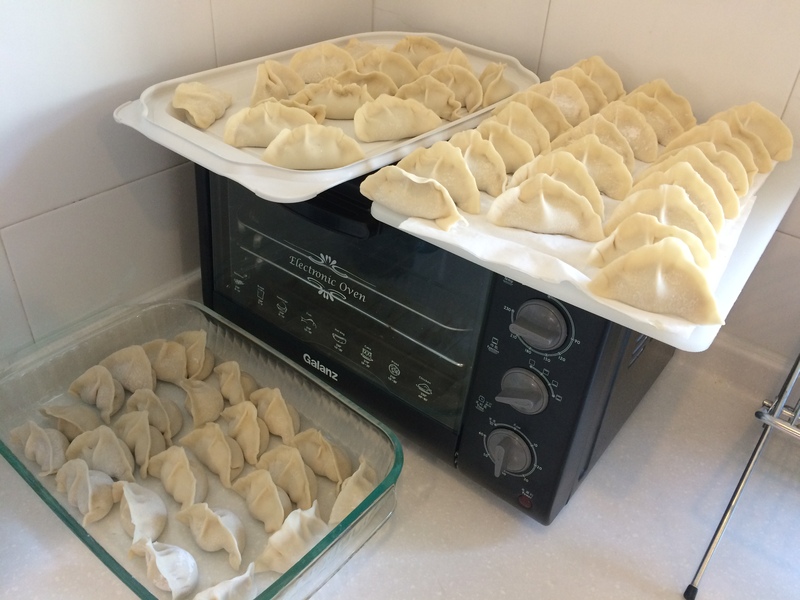 Since I know almost nothing about these dishes, I thought it would suffice to ask our ayi to make some jiaozi for us before she began her vacation. 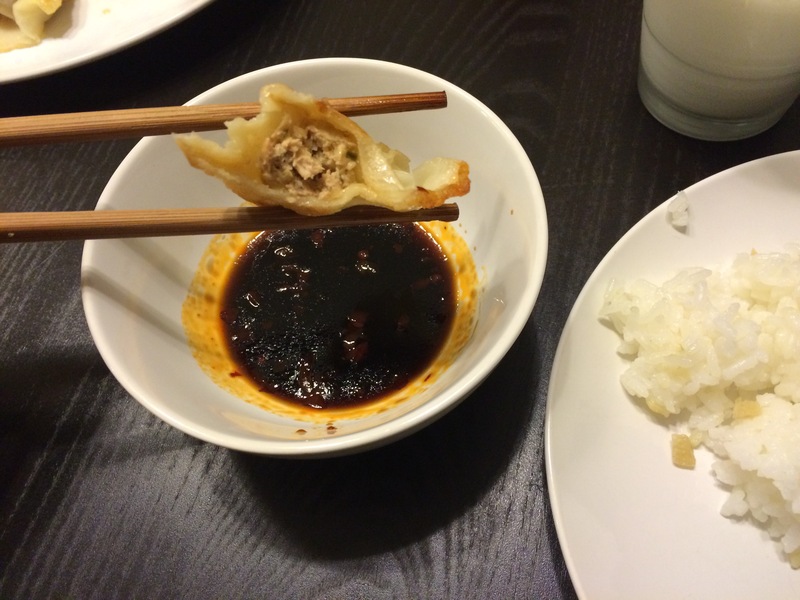 These dumplings taste so yummy dipped in a spicy chili paste and vinegar mixture. 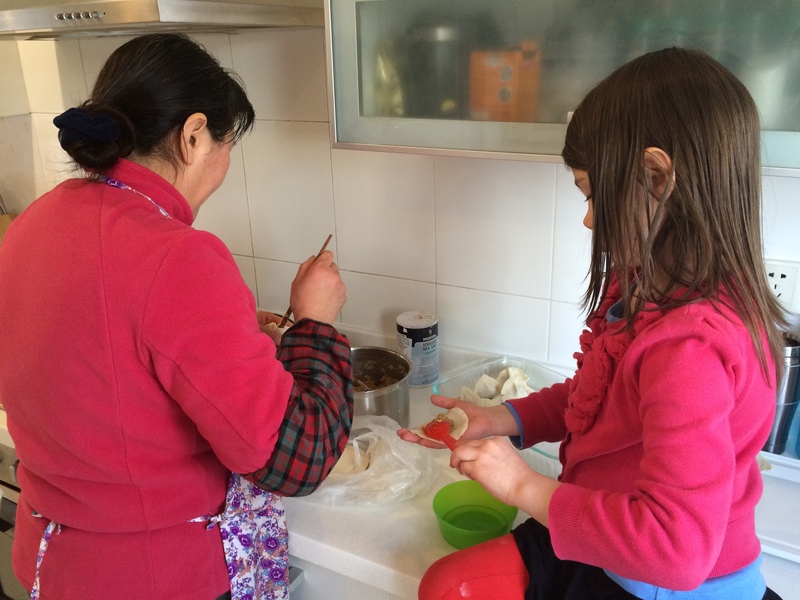 Our ayi taught my daughter how to prepare the jiaozi. The jiaozi waits to be boiled. I would love to someday share in a New Year’s eve meal that is truly Chinese. In the meantime, we ate our own concoction of American and Chinese foods to celebrate. I enjoyed our evening together as a family, but to be honest, I felt like we were missing something… it was like having Christmas alone, without grandpas and grandmas, aunts, uncles, and cousins. Maybe we can convince someone to visit us to celebrate next year. The fireworks in China during the new year holiday are fantastic. Personally, I think that since China invented fireworks, they ought to be spectacular. A good friend put it this way: It’s like all of the 4th of July shows you’ve ever seen, and ever will see, rolled into one night. 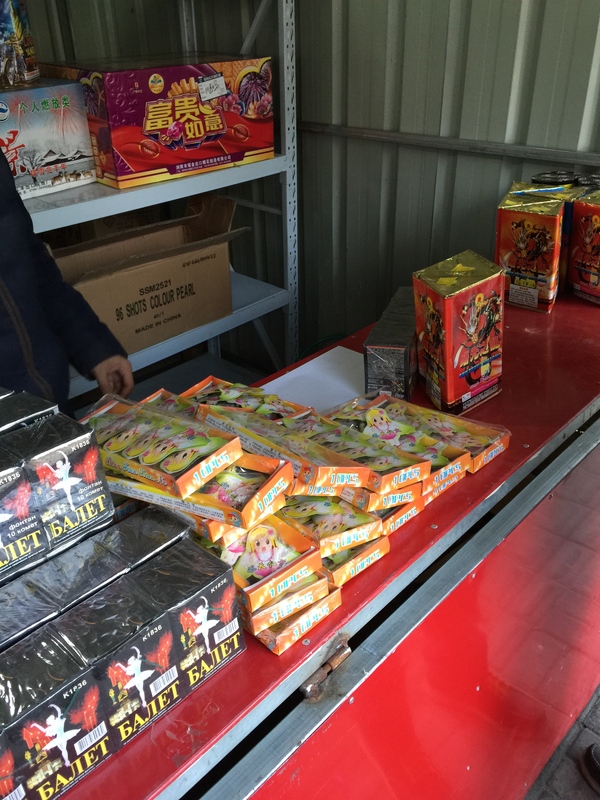 Although the police were cracking down a bit more this year on people who might go overboard, fireworks here are basically a free-for-all. 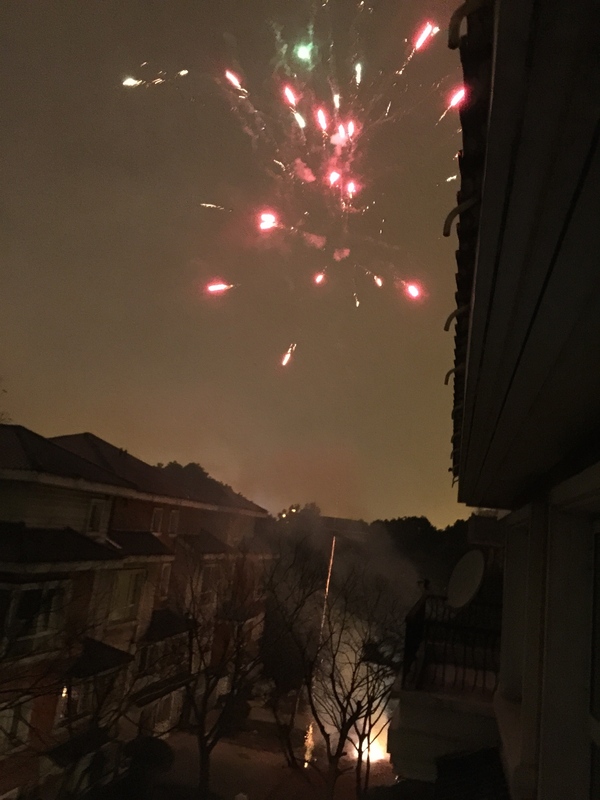 Many of our friends have told us stories of their balcony windows being shot out by stray fireworks, or of having to cover their children from fireworks that turn on them from the other side of the street. 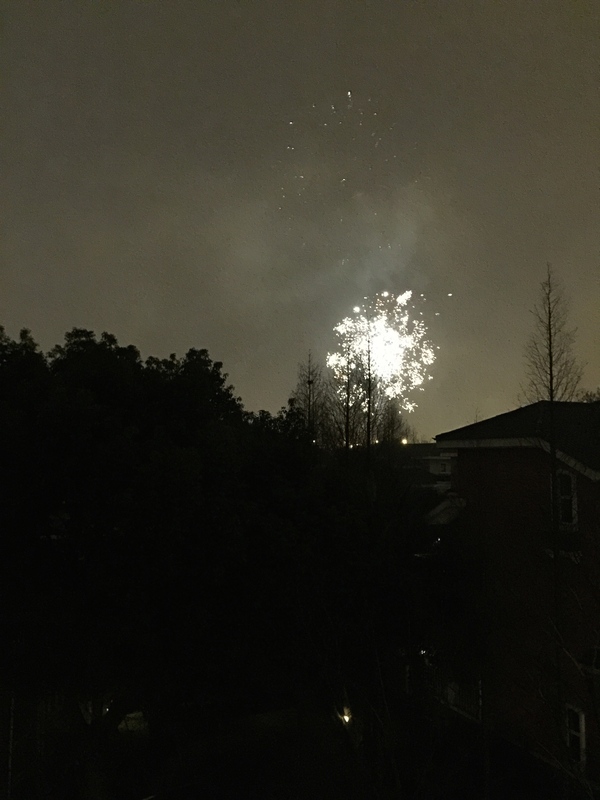 One of my Chinese friends explained that people shoot off one set of fireworks to say good-bye to the previous year and another set of fireworks to say hello to the new year. Each night of the week also gives a different reason for fireworks, and the most popular is the fourth night, when fireworks are lit to welcome the money god. 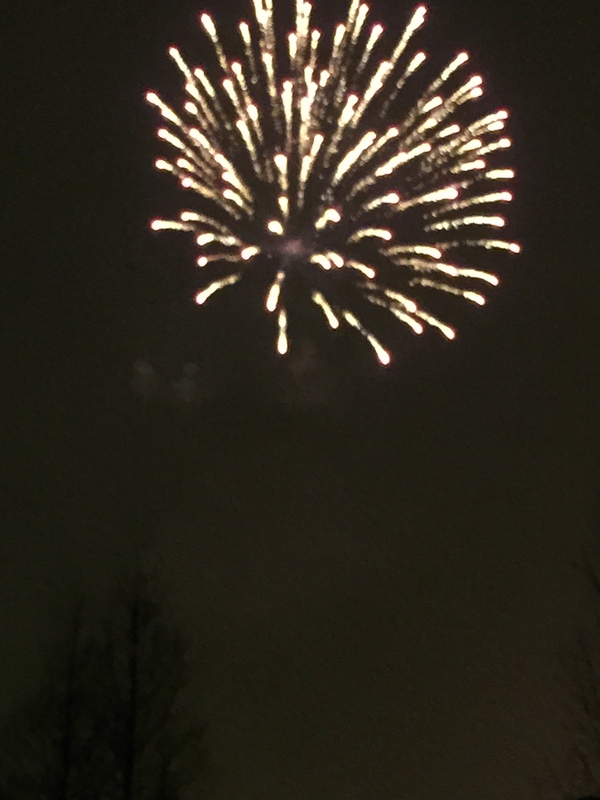 The amount of fireworks on the fourth night rivaled the amount the we witnessed on New Year’s eve. 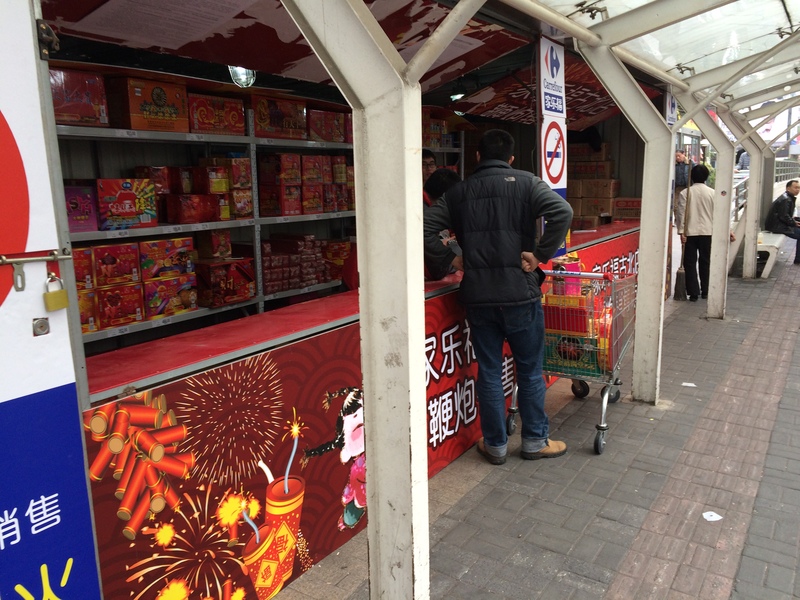 Firework stands popped up on every block the week before the new year. Notice the “No Smoking” sign on this one. On New Year’s eve, our family went out and lit some sparklers, one fountain, and some ground spinners. 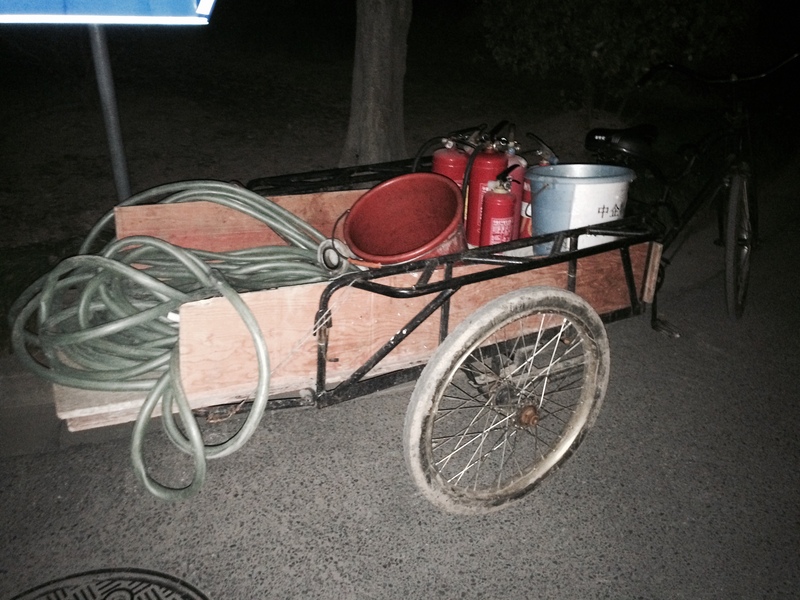 On our walk outside, I noticed that our security guards had also prepared for the new year fireworks. There are no firework restrictions in our tree-filled neighborhood, so the guards had to be ready for potential fires. Around 11:40pm, the booms began to accelerate. We stood out on our bedroom balcony to see more clearly. The sights were beautiful, with bright blasts and golden fizzles. The flashes of light bounced off of city buildings and lit up the sky in every direction. Almost more incredible were the sounds. With pings and explosions ricocheting through the city, our neighborhood turned into an audio war zone. Our neighbors uncoiled a massive roll of firecrackers, which stretched from the beginning of our “cul-de-sac” to the post near their house that they attached the end of the firecrackers onto. They had this down to a science. A little before midnight they came out, laid everything out, and lit it up. Once the firecrackers started popping, they went into the house to save their eardrums. Josh and I stayed out to watch and hear the spectacle, and my ears rang for minutes afterward. It seemed that there was an entire fireworks show on every block, which made it challenging to take everything in at once. 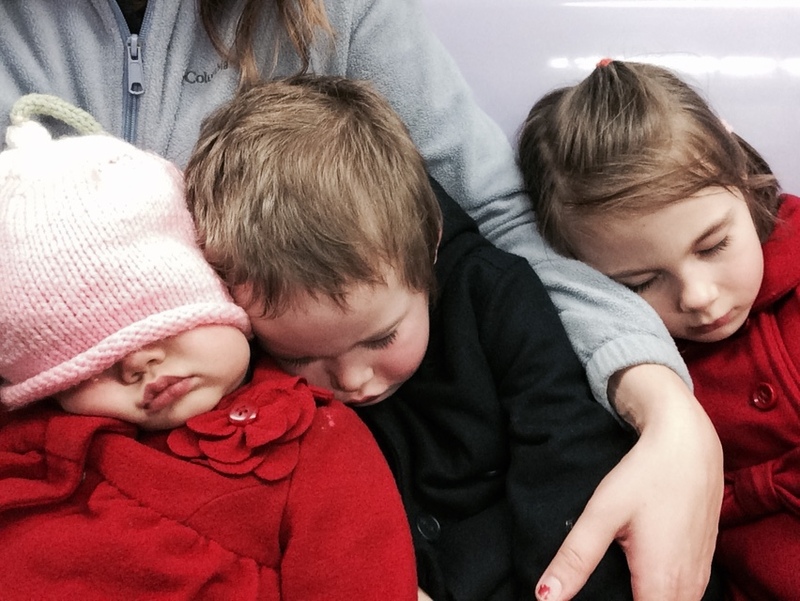 Our incredible children slept through the entire production. 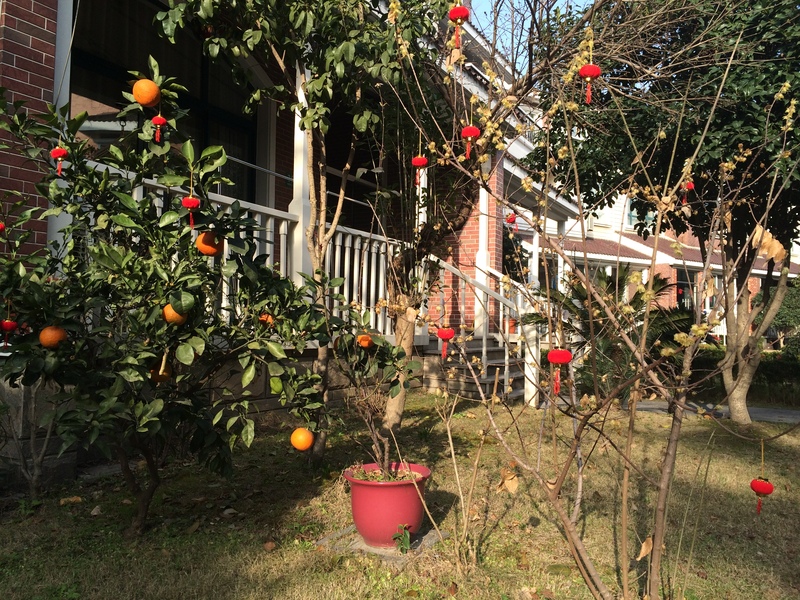 The next morning, our neighbor went out again to unroll his coil of firecrackers, this time to welcome the new year. I was just loading the kids into the car when I noticed activity next door, so I pulled them all out and we watched from the sidewalk. Our neighbor was kind enough to smile at us as we all gawked at him and as I tried to explain to the kids what was happening. Our neighbor used a coil of firecrackers similar to the rounds in this photo, except that his was bigger. 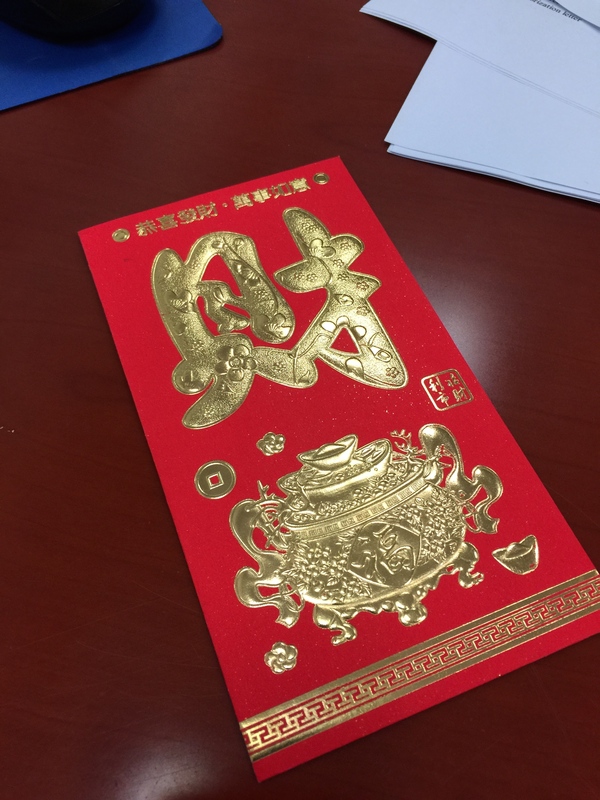 As soon as the noise subsided, our neighbor came back out of his house and handed each of our kids a red envelope, which brings me to the next aspect of the lunar new year. I could be wrong on this because I haven’t seen it in person, but my understanding is that on the morning of the new year, children wake up early with excitement to rouse their parents out of bed. The children bow in respect to their parents and ask for a hongbao, a red packet or envelope, which contains a gift of money. My eldest daughter had been begging for a hongbao for weeks before the lunar new year. She learned about it from her Mandarin class at school, and she received an envelope from her teacher which contained chocolate coins. I told one of my American friends about how generous and thoughtful it was for our neighbors to also give a hongbao to each of our children. We observed that in our culture, giving money is a cop-out gift, the kind of thing that you give to someone when you don’t want to take the time to be personal and creative with a gift. But here, at least at this time of year, a gift of money feels like something special. For us, it was also a great opportunity to work on the kids’ math skills and to teach about saving, giving, and spending our resources. Many children also receive clothes, since wearing new clothes is a tradition on new year’s day. It reminded me of the American tradition of getting a new dress or suit for Christmas and Easter. It’s a big deal. 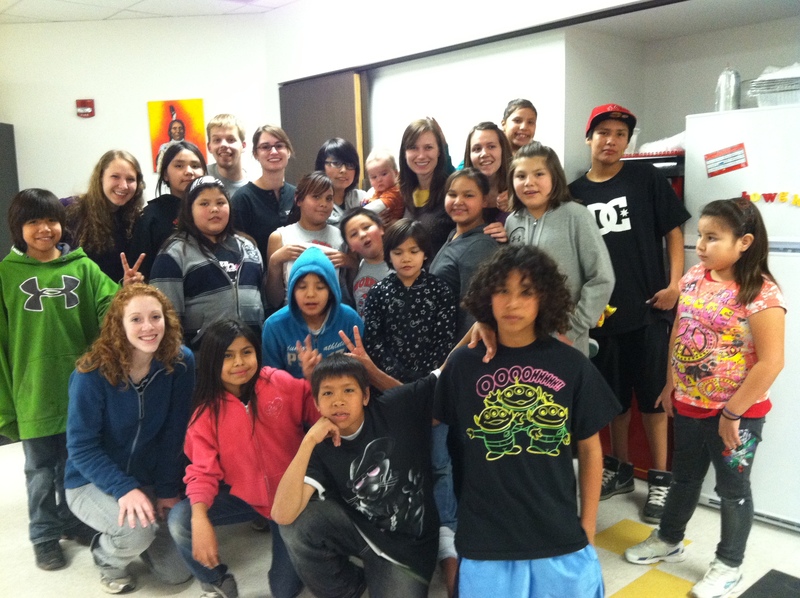 However, the only new thing our kids received was toothbrushes (because they needed them!). They don’t know anything different, so they were actually quite excited about their little prizes. Everyone beings a new year with hope, with expectations for what this uncharted year could bring. One of the best questions asked of me in college was, “Why do you get out of bed in the morning?” The answer cannot be as simple as, “Because I have to go to class” or “Because I have to go to work”. You don’t HAVE to do those things. Some motiving factor underlies those decisions. Why do you work? Why do you go to class? It’s worth asking: What do you live for? So much of what we live for is merely trinkets, stuff that will rot or go with us to the grave. But I’ve been reminded lately that the hope of the nations, the one that won’t fade, is Jesus Christ. And He gives so much joy – like the blow out your eardrums with firecrackers, dance in the streets, eat huge meals with people you love – kind of celebratory joy. I don’t know about you, but I spend far too little time celebrating my hope. To all of my Asian friends, happy lunar new year! 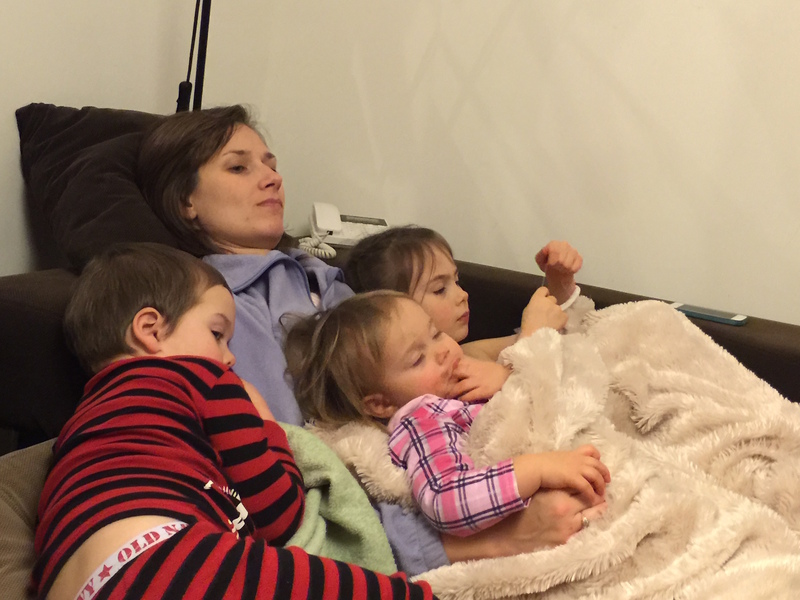 Twelve months ago, I worked 30 hours a week outside of my home and in my “free time”, I cared for my three children, all under the age of five. Six months ago, I moved overseas and began a new season, in which I worked, and still work, fulltime within my home as a “stay-at-home” mom. I have lived on both sides of the street in the same year. It is out of the beauty of these two experiences that I write to you, my fellow mamas. Happy Valentine’s Day, mamas; you are loved. That question hit my weak spot like a sharp arrow. I couldn’t control myself; I started crying as soon as I answered, “I don’t do anything. I have three kids.” The two men stared back at me dumbfounded. The meeting was a disaster. When I had my first child, I discovered that my work life changed. For the sake of the child that I loved, I put boundaries on the time and energy that I spent working. For the sake of the work that I loved, I left my child in someone else’s care each week and was absent from home often on evenings and weekends. I felt that I could do well in both roles, but because my energy and attention were divided, I felt that I could not be excellent in either. And so, after five years of pouring my entire self into two different worlds and juggling my time and energy between my children and my work, the businessman’s question brought my inadequacies to the surface. Of course I knew that I should be involved in the community. Of course I wanted to be involved in the community. But I was a mama stretched thin, who felt guilty for neglecting something that I had no capacity for. At some point, working mamas, we will fall short of expectations. Even with all of our energy and best effort, we will fall short of our employer’s expectations of us, or of our children’s expectations of us… or more likely, of our own expectations for ourselves. Interestingly, the Bible paints a picture of what some people see as the “ideal” woman. Talk about pressure. One thing I appreciate about this theoretical woman is that she works. She works hard. Below are some excerpts from Proverbs 31:10-31. This lady knows business. And investments. And finances. And social justice. And the right thing to say at the right time. And she receives the respect of her children and her husband. I want to be like her. But seriously, when does she sleep?! Her lamp does not go out?! Listen, mamas. You and I cannot be perfect women. I know, it’s difficult for those of us who care about meeting goals and reaching desired outcomes to admit that. But falling short opens us up to receive grace and truth. Mama, you are a person of worth and value apart from your children. You are a person of worth and value apart from your career. Producing many well-behaved children does not make you worth more. Making a name for yourself or earning more money does not make you worth more. You have worth because God loves you. God the Father was pleased with Jesus before Jesus accomplished anything. God the Father was pleased with Jesus because of their relationship. Mama, God is pleased with you because you are His loved one, the one that He created and formed. Think about your own newborn baby. Before that baby could even smile back at you, you loved him or her. Because he or she was yours. And God loves you, regardless of your accomplishments, because you are His in Christ Jesus. What gives a woman noble character? Even our best efforts toward perfection are not good enough to meet God’s standards. Only trust in Jesus Christ can give you a right heart. This ideal woman has a major thing going in her favor. She lives in honor and awe of God. When you build your life on a foundation of loving and honoring God, He will give you the strength and wisdom that you need to make a mark in your home and to make a mark in your workplace. One thing from Proverbs 31 is clear. This woman’s work blessed her family. You also bless your family through your work, in more ways than bringing food to the table. Your calling as a professional and your calling as a mom are not separate callings; they are linked by you and who God created you to be. Can you lead a team of people? You can invest in your children with long-term intentionality. Can you network? You can instill in your child the gift of knowing how to connect with people and show them grace. Can you responsibly oversee finances? You can teach your children to manage their money for good purposes. Can you speak with authority? You can direct your children to proclaim truth with gentleness and clarity. Can you work ethically and faithfully in your field? You can influence your child to live with integrity. Can you strive toward accomplishing a big vision? You can encourage your child to expect seemingly impossible things to become a reality. Can you talk about your work with honor and pride? You can give your children hope to have a job for themselves that they can also enjoy. The skills that your job refines are the skills that your kids need from you at home. God knew what He was doing when He called you into your work and also called you to raise up little ones to be wise men and women. And you, a mama loved and valued by God, are enough for your calling. May your children grow to look up to you and call you blessed. On a normal morning at home, I decided to call a friend who lives in the States. While we chatted, I prepared and fed my kids a snack, cleaned up the living room, and took toys up two flights of stairs to put them away in drawers. My sudden outpouring of tears caught me by surprise, and I realized that I had just heard words that I needed, but I didn’t know why I needed them. That’s when I decided that I’d better take this message seriously. I asked my husband for 24 hours by myself for my birthday, and during that time away, I started asking God why that truth was so important to me. As moms who work all day at home with our children, our work never reaches completion, at least not within a year or two, or even a decade. In the middle of putting makeup on in the morning, one child frustrates the other, who proceeds to whip their toy at the instigator, pelting them in the back. In the midst of the screams, we pause everything for a “teaching moment”, aware that we will have the privilege of at least twenty more teaching moments before the sun sets. The laundry still tumbles in the dryer while a child dirties another pair of pants. Every dish is finally placed in the cupboard when a child asks for their third snack in two hours. While we pour the milk, popcorn seeds free-fall from the bag and scatter, bouncing across the floor. When the children lie in bed and the house sits hushed and quiet, we moms still reside in our workspace, with a list of a dozen tasks yet to begin. We mamas know that it is a gift to work all day with the children we love, for little kisses and chubby-armed hugs; but it is not easy. We pour out our best work when we are alone, with little to show for it in the short-term, for small people who do not even think about giving us accolades for all of our labors. But mama, God sees you. He knows what you are going through, your love for your children poured out in a hundred ways per day, your energy and ideas given freely for others. Because God sees you, you are not alone. Every little thing you do for your children holds great worth to Him. He values your many roles as master chef, toy repairman, teacher of all subjects, counselor, social coordinator, nurse, athletic coach, entertainer, housekeeper, organizer, cheerleader, moral guider, security guard, etc. He knows that you are a good mom. There is a famous story about how Jesus reacted to little children. You know, the one displayed in the paintings of Jesus with multitudes of serene children sitting on his lap. I think an artist should create a more realistic version of this scene, in which children race in circles around Jesus’ legs and shove each other over in order to sit in His lap first. Simply put, God loves children and values taking the time to hold them and bless them. He considers children to be of so much worth that He even gets emotionally upset about a disregard for these little ones. When you love your children, you engage in work that aligns with the heart of God. The long-term effects of your work are unparalleled. You bless ones who have open and tender hearts, who have the capacity to grow into men and women of strength and grace. You have influence. I found this verse, which I now have posted on my kitchen cupboard. As you serve your children, even when you feel weary or alone or of little value, the Lord strengthens you for your work. God sees you chopping vegetables. God sees you spraying stains. God sees you picking up toys. God sees you bandaging wounds. God sees you teaching children to forgive each other. God sees you raising up the next generation of men and women who will love Him and change the world. And that is a work of highest worth.